Sub Sea Systems, a world leader in innovative products for the marine tourism industry, will debut its latest creation, Aquaticar, at the 2018 Deal trade show in Dubai this April. 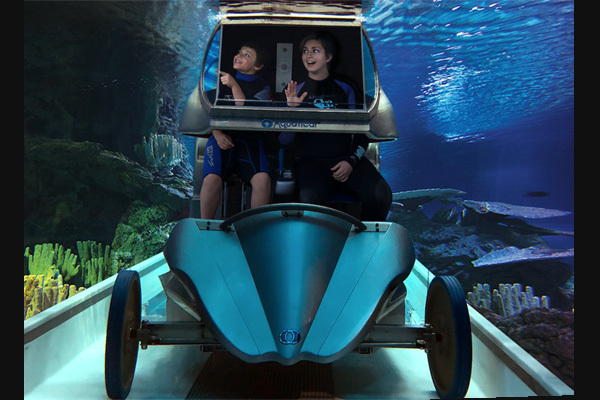 Aquaticar is the world’s first underwater driving experience. Adventurers age 5 and up can drive futuristic vehicles through an underwater world of wonder that can be themed to fit nearly any experience– from a teeming coral reef to a rugged Mars landscape, or even a dark ride with startling surprises around every corner. Guests are dry from mid-chest up, and wet from mid-chest down, allowing pioneering underwater drivers to feel the rush of water as they steer their vehicle through the themed environment. Two guests per vehicle dry-load into height-adjustable seats, while a staff member pivots a canopy with a large acrylic-viewing panel into place overhead. Loaded vehicles transfer from a moving platform onto a specialized track, where gravity feeds cars into the themed body of water. Vehicles travel along a defined track, complete with straightaways, curves and hairpin turns. Guests can steer the vehicle within the confines of the track, but cannot steer off course. The track is comprised of modular track segments that connect to form a variety of course layouts and distances. Air registers embedded in the track are triggered by the passing cars and release a calibrated flow of air beneath the vehicle as it passes over. The air not only provides fresh breathing air to the canopy, but feeds the car’s Bubble Engine, another world’s first. The proprietary Bubble Engine features customised rotors that harness the uplift force of air bubbles as they naturally move toward the water’s surface. The Bubble Engine generates enough power to drive the vehicle underwater at a speed of about 2 mph (3 kph). The total ride time is approximately 4 to 5 minutes, with capacity for 400 guests per hour.